Some people just don’t enjoy us having nice things. 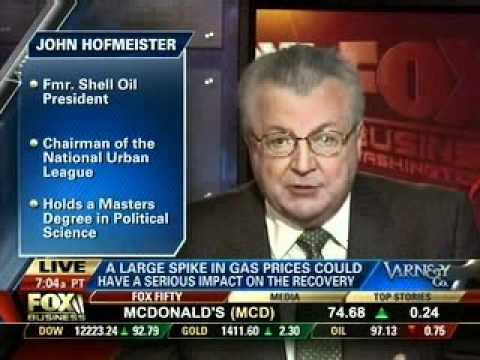 Take John Hofmeister, pictured here on FOX Business News discussing gloomy forecasts for rising oil and gas prices. As you can see, he is the former president of Shell Oil. He knows a thing or two about the roller coaster of death we know as “gas prices” in America. In 2010, he predicted gas prices would spike as the global demand for oil would increase. In 2012, he returned with predictions of “better than a 50 percent chance” that barrels of oil would surpass $120 a barrel. He wasn’t totally off-base. Remember $4 a gallon, anyone? It was like it was just last year. Now he’s baaaaaaaaaack. Most of us read that and hear the indecipherable sound of Charlie Brown’s mother talking. However, the translation is that $5 per gallon gas will arrive before we know it, scary exclamation points!!!!!! Of course, there was a catch: Hofmeister was shilling for awareness of natural gas, because of course he just happens to be the head of an organization called Citizens for Affordable Energy. This appearance was a nice PR move because consumers don’t understand why prices skyrocket, they just point and blame. Good for him, can’t we just enjoy a “good for us” moment while the prices are so low?